FUM is a small charity working in the Tabora Region of Tanzania, specifically in the Districts of Nzega, Sikonge, Urambo and Kaliua. We are an association of friends who each give money to support our projects in Tanzania. From time to time we receive support from other organisations to help with specific projects. Our main areas of interest are: education, health, water and agriculture. We are concerned with advancing the development of the people of the Tabora Region but also with educating young people in the UK. To that end we not only provide funds for projects in Tanzania but facilitate educational visits by UK schools and individuals to the Tabora Region. 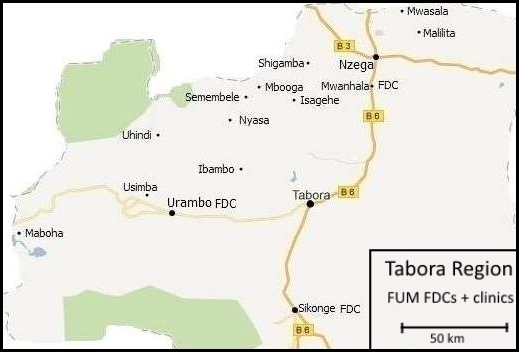 FUM has operated in the Tabora Region for over fifty years and has developed a good working relationship with the Tanzanian Government. The Regional Commissioner, Tabora is one of our two presidents and the district authorities have appointed FUM coordinators in each of the districts. FUM is a very cost effective organisation. All its officers are volunteers and as a result we have very low administration costs with more than 95% of donations spent on projects.